Did you know that dropping things is a skill that has to be learned? Just a few days ago I accidentally taught Olivia how to drop stuff…. I was playing with her and decided to make a game out of crumpling up newspaper and throwing it in the air. Naturally, she thought it was just hilarious, and starting trying to copy me. She would take a piece of paper and rumple it twice in her tiny hands and then open her hands to let it fall 5 inches to the floor. Then she would look up at me with the biggest, cutest smile in the world, and clap her hands! Ever since then, she has been purposely dropping everything she can get her hands on. 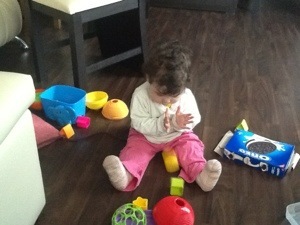 Before, she often dropped stuff, but only if she was opening her hand to get something more interesting. It had always slightly surprised her that the old item she had been holding fell with a “clunk” to the floor. Now she does it as a game; and although sometimes it is annoying (like when she drops her food) mostly it is just cute. Now it’s time to work on setting things down carefully!